Cats Protection has an exciting new partnership with Tabcat. As well as ensuring your cat is microchipped you could use Tabcat, a pet tracking device, to offer you even more reassurance in the event that your cat goes missing. Attaching easily to your cat’s collar (make sure it’s a quick-release collar), the device is lightweight but robust enough to stay secure wherever your cat chooses to roam. 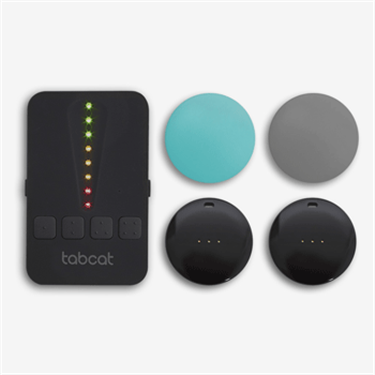 The Tabcat tracking device is combined with a directional handset, which picks up the signal from the cat tag on your cat’s collar and tells you how to locate your cat through a series of sounds and lights. A single red light means that you’re in range; an amber light indicates that you’re getting closer to your cat and a green light should guide you directly to your cat. Each handset can find up to four cats and can track up to 122m. Thanks to our friends at Tabcat, you can enjoy 10% off their products when using the code CP01. Cats Protection will also receive 10% of the value of every order, enabling us to help even more cats and kittens in need.